I'm converting a small cargo trailer into a tiny trailer that can be used for sleeping and living. The cargo trailer is a TNT brand DBL 'A' 6x12, White, 12" extra height making it about 7 ft high on the inside. The extra height is well worth it I think for a sense of space. Side and roof vent (side vents are so small that they bring in very little air. The roof vent can only be wide open if it's not raining). RV door lock that locks from the inside (vital) and barn doors that lock from the outside (easier to handle than the ramp door). You may want to move the lock to the inside when living in it. Front and roof are curved in this one. I have seen better prices in the US, you can go smaller and get a better price, but for me 6x12 is the minimum amount of space needed to make a happy little home. Joey was able to do this for $7000 with the factory doing most of the work. In the Facebook group Mold Avoiders on the Road you can see people having smaller trailers renovated for under $4000. Install window - 24 x 30 vinyl awning style to stay open even during the rain (you're going to need air in such a small space). It’s vertical so that the framing did not need to be cut. I do not find the hard vinyl has a smell but you can use aluminum. I wish I had put in two as it's nice to have windows. One does bring in plenty of light though, along with the vent on the roof. 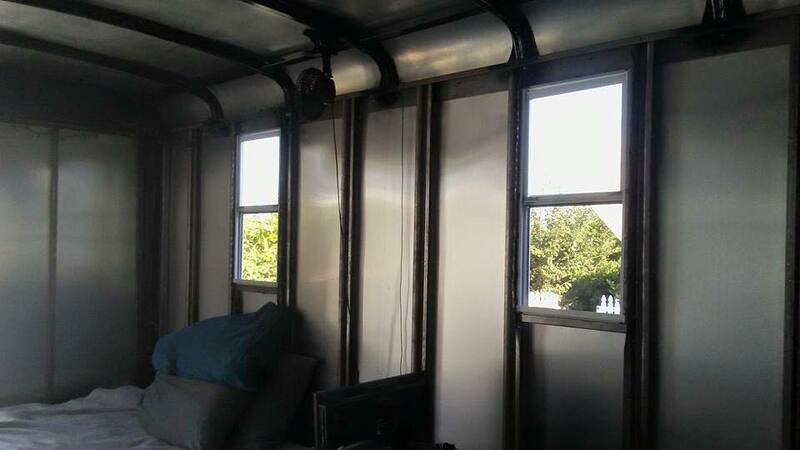 You can look for an RV window or you can use a tempered glass house window and reinforce the framing around it. Install metal flooring 3/16 hot roll plate steel flooring, 1000 for the metal + welding. See this thread for an in-depth discussion on what type of metal to use. 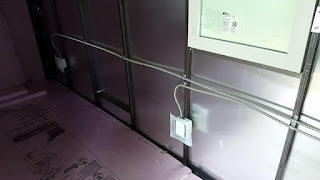 Electrical work - 30 amp panel with a campground plug and 4 outlets inside. You may be able to make do with fewer outlets but the electrician wanted a dedicated outlet for the fridge and one for the heater. Then I have one near the bed for computer etc, and there is one up high to string up a light and run any kitchen appliances. Have these renos done by the factory and not after you buy it. This was a huge mistake that costs me a lot of money and didn’t save me any time like I thought it would. I should have known better as I had read Joey's conversion story (highly recommend reading that for another version of a conversion and some ideas on what you might want to add. I disagree that foam doesn't provide a lot of protection from the cold and heat. 2 inches of XPS is R-10, that is really good). How long it will take to customise one depends on the brand, the factory and the time of year. Add 2-3 weeks on to their estimate. The back door in mine has structural plywood so that still has to be removed and needed metal reinforcements. The front end had plywood between the frame and the skin which was a major pain to remove. Look for a brand that does not have these two issues and you will save a lot of money. If you want to do it yourself check out this thread (you have to sign up). Watching someone's account of doing it herself is well worth it. You will see tips on taking out the plywood and choosing a metal for the floor. Do the Walls Need Reinforcement? 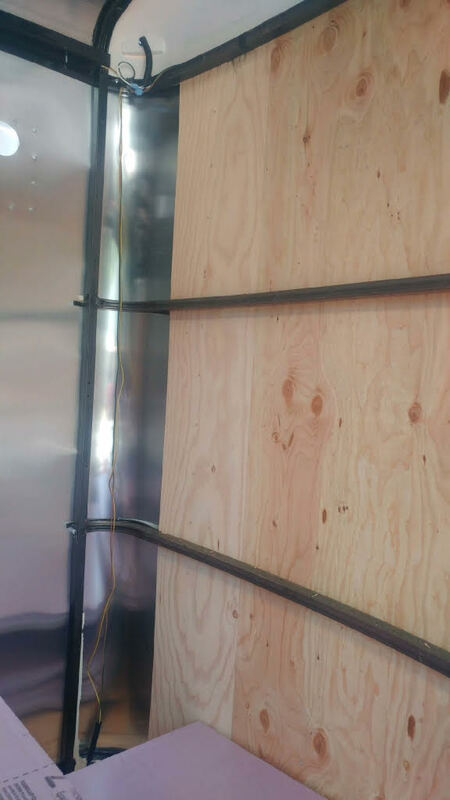 A big question with cargo trailers is if you need wall reinforcement when you remove the plywood. There are two answers to this. The first is that it depends on the brand, some brands will tell you that their trailer is good to go with no plywood, these have thicker frames like the steel CM trailers. Or some companies can customise it with thicker frames. See pictures below. The second answer is that the companies might say they are not strong enough but people leave it un-reinforced anyway. Erik Johnson, me and two other mould avoiders have taken out the plywood and not added anything that would replace it structurally. Mine started leaking and the company that sold it to me claims that the reason it leaked is because the plywood was taken out and this means there is less stability and it's easy for pieces to come apart and caulking to come loose. I have braced mine since. If they won't customise it without plywood, remove that part yourself and reinforce it (or don't) yourself. 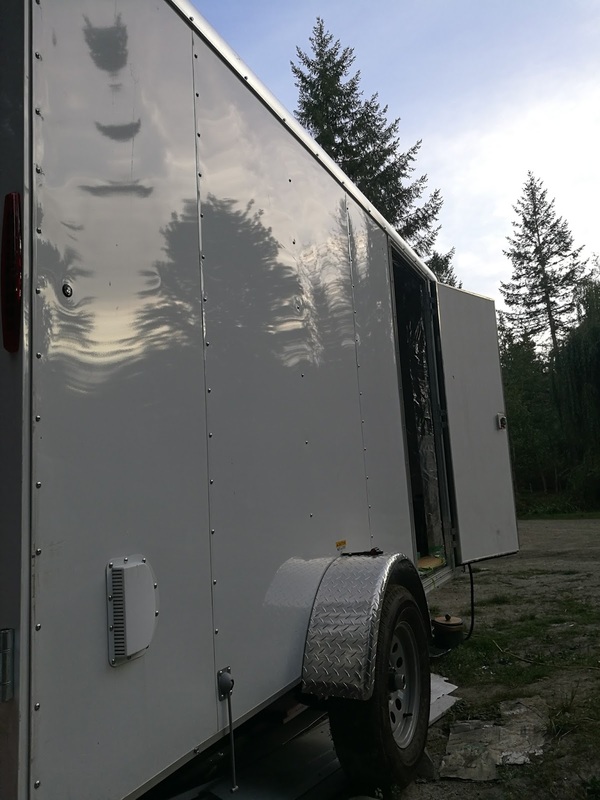 The first picture is a customised trailer reinforced with aluminum frames. Very robust. If you look closely you can see tape between the frame and the exterior, a mould risk. The second picture is a CM all steel trailer with a robust steel frame, the frame is standard and the company does not recommend reinforcement. The third picture is a standard frame, with plywood removed. Though it's not reinforced the owner is doing just fine with moving it around frequently. The brand is Victory. This picture is my trailer it has the least robust frame of the bunch, while the seller advised that it could be reinforced for longer trips (he told me this after the insulation was up). I have now braced/added strapping. A cargo trailer smells much stronger than someone might anticipate a new metal box to smell. An extreme avoider in a hot climate would leave it sit for about a year before using. I have seen two people who have turned around and sold them soon after buying due to the strong smell. Mine is now a year old and not totally offgassed. Caulk of different types, double-sided tape (you do not want to buy a cargo trailer with tape in the frame - this is a mould risk), plastic on the back of the RV door, plastic and glue (very smelly) in the vents to the point that you will likely not be able to use these vents for air, rubber and foam (glued on) can be found around the RV door, around the barn doors, and possibly around the window on some models, there may be tape holding up wiring, there is the usual plastic coating on the wiring, plastic light and light switch may be included, there may be spray paint on wiring, there may be caps on bolts, screen on top vent, there is also exterior paint which some people have said they are offgassing but I could not pick up a smell on. In such a small space there are also the tires on the outside to consider - on a hot day you will smell these. Rustproofing chemicals may also be added to the frame. (Thanks to Madonna Ramp for some of these materials from other brands). A lot of this can be covered and you can see in mine that it is almost completely sealed up. If you buy one and it smells strong, give it time and/or seal it up like I did mine. Every trailer takes time to offgas. Someone was able to get the company Mirage to build without glue or caulk, but she was not able to tolerate the trailer brand new. I would not recommend leaving out glue and caulk. I did not see any used cargo trailers in my area when I was looking but you can sometimes find these. You would want to know what it was used for. Look for gunk and rust that will accumulate at the bottom around the frame. XPS Owens Corning Foam 2 inches on walls and floor (you can also use polyiso, the most well tolerated foam, or EPS which is not a vapour barrier on its own but is usually faced with foil or plastic). 2 inches XPS is R-10. If you are going to a climate that is extremely cold, add another layer of foam - polyiso or XPS on the inside until you get a high enough R-value for your climate. The reason I chose XPS is that is has a high R-value and it doesn't lose its R-value in very cold weather like polyiso does. I also could not find polyiso in my town. 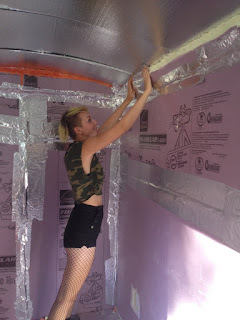 1 inch Foil backed EPS on ceiling (because I needed something thin enough and flexible enough to be curved on the ceiling) (Note: This is backwards, there should be more insulation on the roof but I wanted the roof to stay curved and the insulation to stay between the frame so I kept it simple.). The brand was R-Tech but I can't find a link for this. I can add another layer of 1-inch foam if it gets too cold. 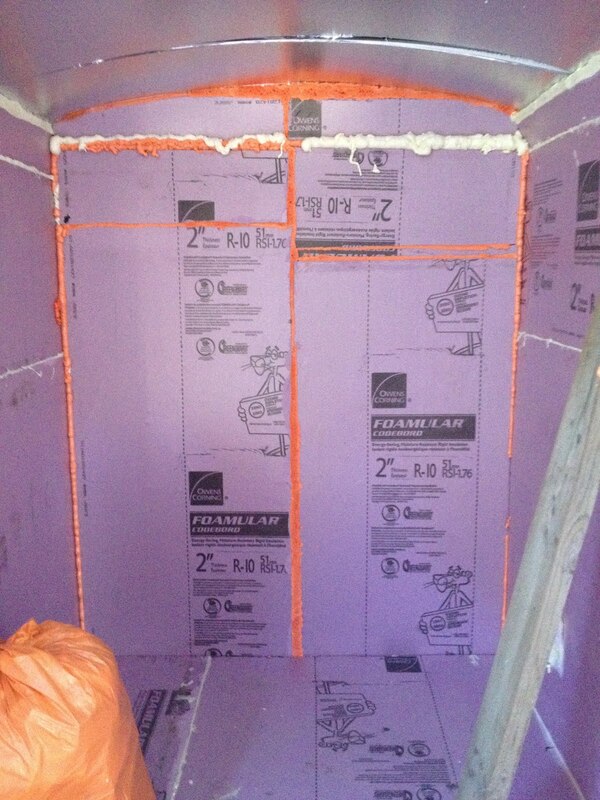 Great Stuff spray foam on the gaps of the rigid foam (airtight so no moisture gets behind the foam). There is one for small gaps and one for larger gaps you will need some of each. Heavy Duty aluminum foil glued up to seal in everything. I don't recommend this method after trying it. Blocking moisture between the foil and the foam is a mold risk. There are other ways you could totally seal in the smell with metal walls and silicone as a gasket. The problem here is not being able to check for leaks. A Fantastic Fan in the roof vent would be helpful for ventilation, drawing air out of the top will draw it in the window and turn over a lot of air. The fans also help with humidity. 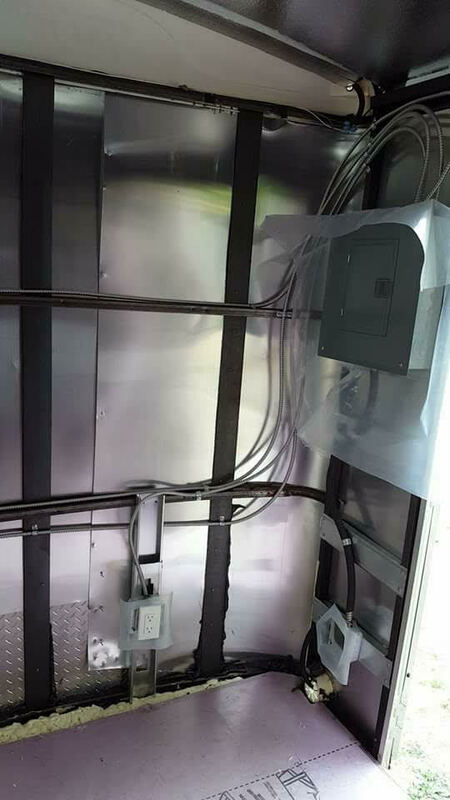 This has to be wired in with the electrical. The foam is not being held in place by anything other than the power of it being held between the floor and ceiling. You can use some tape or glue if necessary. The canned spray foam is filling in the gaps (leave that to cure for at least 24 hours). 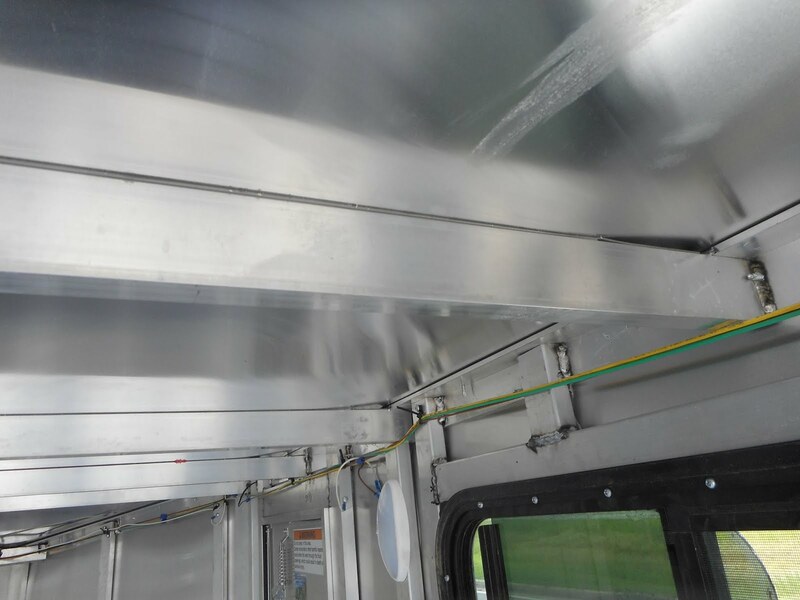 Over the seams we put heavy duty aluminum foil. We used natural glue to attach the foil - although it did not mould behind the glue, I don't recommend this, I wouldn't try this again. There is a rumour that spray foam will crumble with movement in a trailer but speaking with the company Great Stuff and some folks who have taken apart trailers they have not seen this be a problem. In an ideal world you have 2 competent people working on this full time you could get it done in 4 or 5 days. Add extra time for real world problems. All this metal and foil did not stop wifi or cell phone reception - it lowered my wifi connection only slightly. If you are concerned about EMFs consult with an EMF specialist and test out a metal structure before buying. In theory, it is a Faraday Cage that blocks out some external sources of EMFs and may intensify what is on the inside. My first attempt totally failed. I tried to buy a cargo off the lot and sleep in it within three days. We put up XPS over the plywood (sealing it in in a dangerous double barrier system), we used tuck tape to tape up the foam. This absolutely reeked. 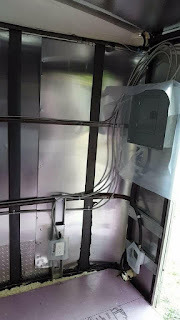 Then we covered the entire interior with mylar blankets and taped that up with aluminum foil tape - that absolutely reeked as well. So from there we took everything down and did the renovations properly (which means taking out plywood and putting in metal floors and a window). I found out taping up seams was not going to work. Even the most tolerable foil tape in a small enclosed space becomes overwhelming (I am very sensitive but not by any means among the most sensitive). The second attempt with foil wallpaper failed as well. The trailer started leaking at various points and I could not see this because of how well it was sealed up. Mold and rust started growing under the floor. We tore it all up a second time. The third iteration is in progress now (summer 2018). My TNT Mirage Trailer has a number of poorly built aspects. The company took no responsibility for this and the leaks. What has to be fixed on this model or checked on any model: The back doors were leaking, the top sil needed caulking, the door seals were not done right, the doors were bulging at points, bending the doors and adding gaps for leaks. The front diamond plate had nothing behind it, it was a negative lap - a poor design, the front wall should come all the way down. The front plastic cap on the top roof is also a negative lap. Vertical seams have the ability to let in water in a big storm or when driving it in the rain. Always check windows, doors, and any openings. Screws should be caulked as well. Look for a well done roof design. This roof design is good. I have seen custom designs with vulnerable roof seams. Aggressively hose test this before adding insulation and know where the weak points are. After moving it is when things are most likely to come open. When recalking parts, attempt to open things up and get caulking between parts and not just over the seams. Erik is the pioneer of cargo trailer living. He called his trailer and camper MECUs (Mobile Environmental Containment Unit). Erik used EPS foam without flame retardants. I don't know how he sourced this but I would think this is the kind used for packing, not insulation. In Erik's trailer, he left a gap (like I did) between the foam and the exterior. He put in weep holes at the bottom in case condensation did find its way to the back. Some trailer like mine come with weep hole. He has said that there has not been any condensation at the back and he has had this for more than a decade. I put the insulation in front of the frame which created a space naturally behind it (though my floors and ceiling have no space). In my third attempt, I'm going to put the floor insulation under the trailer. He has an interesting (non-toxic) method of putting up the foam: Erik says: "I riveted small strips of aluminum to the steel wall studs that are four inches long. For two sheets of two-inch styrofoam. Put the styro in place and riveted one-inch aluminum angle to the four-inch strip, using the "L" of the angle to secure the styrofoam. This vertical angle then gave me a place on the wall to attach shelves." This eliminates the need for spray foam, caulking or tape to seal up or hold up the foam, it also means it's not air tight. This has not been a problem for Erik. Though I was worried in my set up about it not being a perfect vapour barrier. Erik used wooden floors and not metal. Here is a video of his camper which is done like his cargo. You can build out the interior as much or as little as you like. You could add batteries but consider how long these will last you away from plug-in power. You could add solar panels but this doesn't get you a lot of power, it may be easier to just buy a solar kit that is portable that is made for camping. If showering in another building, campsite bathroom, or outdoor shower is not an option for you, you could install basic plumbing. You would want to avoid tanks and have very simple plumbing that goes directly out to a bucket or pipes out into a grey water system. You will have to make sure you are following the rules with grey water here. I want to avoid all cooking, showering, and clothes drying inside to keep humidity down. Options for outdoor showers include simple bucket showers, passive solar shower (that one is PVC-free, unlike most of them), active portable hot water shower (this one comes recommended by mould avoiders), or an outdoor tub big enough to bathe in. A privacy tent can be used to shower outside or set up a toilet outside. You can also DIY and set up something simple like wrap house wrap around 3 trees, or tie string around 3 trees and the string holds up shower curtains. You could install a simple camping or composting toilet inside or use it outside if you need to: some of the options are Luggable Loo, Mini Porta Potty, or Laveo Dry Flush. WALLS: I was going to tack up these posters and some regular wallpaper - Farrow and Ball is a well tolerated non-toxic wallpaper. It is way too humid in here to put wallpaper though. I think that is unlikely to work in almost every climates. I am not eager to cover my walls with metal panels or plywood because I want everything to be simple and easily accessible. 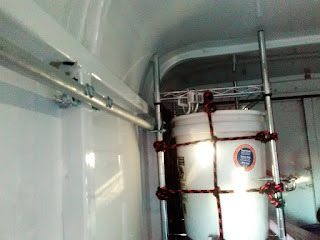 Other options for the wall: the grey side of housewrap, paint foil or metal walls with AFM metal paint, these polyethylene wall tiles (if you can tolerate the glue), seal everything with shellac and then paint over, or, other plastics made for RV/vans tacked or taped up. I will be using plastic RV panels. FLOORS: For now I’m using these mats on the floor temporarily. They smell like straw. I am currently offgassing Marmoleum (takes one month in sun to offgas) but I don't like that there's a jute backing under the Marmoleum against the metal, that's a mold risk) and had considered Cali Bamboo Cork (not sure yet how long it takes to offgas, definitely much longer than Marmoleum). Note: Flooring I ruled out: Thermacork decorative cork the only cork I know of that is heat-pressed with nothing added - not good for floors. It flakes easily and won’t last long. Cork underlayment - I bought this and tested another one that claimed 0 VOC. It is going to need a lot of time to offgas despite these "0 VOC" polyurethane glues (not at all). A year later I have not offgassed the cork floorings (thought they were not out in the sun for a year). BED: My original plan was to customise a locally made solid wood bed with storage underneath - the bed will be up about 2 feet and take up more than half the length of the trailer, creating a large storage space underneath. I would like it to be made partially of Purebond plywood but even that needs to offgas, so I am planning a solid wood bed instead. Cedar is the best bet for holding up to high humidity environments and not going mouldy, but pine should work as well. I will seal it with shellac to seal in as much of the wood smell as possible. (I will do a post just on shellac.) A metal bed frame would be a safer option. In the third try here I think I will go with a metal bed. If you have space, I like this organiser. I’m have this light bulb up (the cord smelled strong and offgassed in my car for a while but then was fine for me). I also like this little nightlight but it won't provide much light. I will mount this silent, energy efficient, space saving heater (which smelled at first but did offgas quickly in the sun) with this thermostat. In the summer I will use a portable AC, I like this one for the level of offgassing. I throw them away every fall as they tend to go mouldy after one season or two and I have nowhere to store them. I’m using this to dry my clothes and I love it. I don't want to add humidity in the trailer so I am using it outside under cover. It works well even in humid and cold outdoor temperatures (and it's not as mini as it looks). I have used this successfully down to freezing. I have not tried it much before freezing but I'm still really happy with it. I bought this fridge which needed a lot of offgassing outside including running it outside. This one smelled more than other brands I have tried like Danby. I like Walmart for fridges as well. I'm using this kitchen island which offgassed fairly quickly but you could use a metal version if you want to avoid wood (and wood sealers and glue). I’m using a pressure cooker to cook - you can make almost anything in this. If you use it outside or at least release the steam outside you will have very little or no added moisture to the trailer. You can get away with no other stove, oven or microwave. You just need an extension cord to use it outside. I’m going to buy the travel Berkey for drinking water, there is no plumbing in the trailer. Berkey is ideal for well water and water from campsites if you are not buying water. In a high humidity situation like a trailer, tent or other camping structure it's important to have a bed and bedding that will not go mouldy. My bed will be up on slats soon (right now I am turning the Thermarest over every few days - it went mouldy so it is crucial to get it off the ground onto slats). Cotton does not hold up well in high humidity, so I have used more mould resistant materials. This heating blanket keeps me warm on very little electricity. If you are worried about EMFs then an infrared heating mat is supposed to be healthier. I am available for consulting to help customise a little "safe room" cargo trailer or custom made trailer. 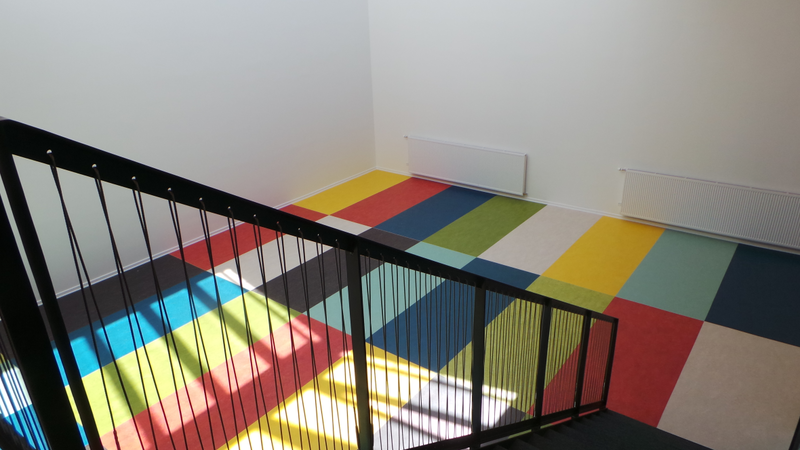 I can help with everything from choosing materials to managing the whole build. I also help you to decide between different housing options, from building a conventional house, tiny house, trailer to setting up tent camping. Here is my consulting page. Affiliates: Making purchases through affiliate links helps support me and this blog. As an Amazon Associate I earn from qualifying purchases through the Amazon links. Thank you so much for this information! I am going to be converting a cargo trailer into a camper/house for my kids and I to travel in. I want to make sure I do things correctly to not have mold issues. I have a tight budget and everything will be done diy. I was wondering about the strength of the trailer without the plywood. This is the only place I could find any information about that. So thank you. I wanted to use pallet wood, since it’s free and hasn’t been made with any kind of glue. I was also thinking to use some kind of natural insulation. I have heard about a wool insulation that is mold resistant and still insulates if it gets wet. We were going to use it in our house but decided to go on the road. Also I’d like to add that I just learned that metal screen blocks out EMFs. That adding chicken wire/ old metal screen in the walls of a house will blocks EMFs. Wonder if that would work? Could use the screen to hold insulation in while also blocking EMFs? So if I were to use the natural insulation and the pallet wood, what should I put between the two? 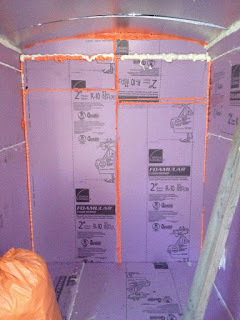 I would also have small holes covered with screening in the bottom under insulation in case of any moisture. Any comments or information would be great! A cargo trailer is a very tricky project. I would not use natural or permeable insulation. I would not use wood in the walls or as the walls in most situations. I did not find that having weep holes was a good idea. If you are heating this trailer you have a very difficult trailer to design. You already have an EMF cage with the exterior shell. Being inside of that and having any electronic devices or electrical appliances inside can be difficult for some people. Thank you for replying. No we will not be heating or cooling the trailer. We will have plenty of windows for ventilation. We will be traveling in it most of the year, so it will be ventilated often. I’ll be reading through all the information on your site and welcome any information you offer. It’s really hard to find this much detail on converting a cargo trailer. Thank you. The only drawbacks of wool insulation are it being expensive (if bought in the US where it's total ripoff) and subject to moths eating it. One can get better pricing buying wool batting off alibaba but with wool one has to make sure what they're getting haven't been doused with naphtalene and doesn't have moths at the same time (so probably best to use natural moth repellent before installing). I prefer camel wool, much better than sheep wool. To Corinne: "I would not use natural or permeable insulation" - this would hold only if one tries to seal it up with vapor barrier (which is a big no in general). Wool insulation is one of the best options for metal trailer; main thing: the internal wall cover must be breathable (I prefer cotton fabric for it, no I don't use polyether which is toxic). Wool is anti microbial/anti bacterial and anti fungal. Real wool (raw), with did not have lanolin removed, resists moisture/does not accumulate it. It breathes (unlike toxic foams) and any potential wall condensation will evaporate without causing mold issues. With foam, not only you have toxic chemicals everywhere you also have accumulation of condensation or leak water on the inner side of outer walls.